Sonny has six books: an autobiography "Hell's Angel", "Ridin' High Livin' Free", two novels "Dead In 5 Heartbeats" and "6 Chambers 1 Bullet, an inspirational book titled "Freedom" and his guide to motorcycling "Let's Ride". Sonny recently partnered up with Jeff Santo to create an Independent film based off Sonny's novels, Dead in 5 Heartbeats. Dead In 5 Heartbeats is adapted from the successful novel by American Legend Sonny Barger, and was shot in 24 days entirely on location in the State of Arizona. A majority of the featured fictional motorcycle club members in the film, The Infidelz, were played by real Hells Angels Club Members. Also, a majority of the MC's featured in the film were authentic and from the state of Arizona - The Hooligans, Alma, and The Rollin Knights. Dead in 5 Heart Beats coming to a theater near you! Robert "Chico" Mora Video Honoring "Chico" from The Movie "Dead In 5 HeartBeats"
On June 29 2013 in Cleveland OH we spent the day with Chico, Jeff & Patch. We were there promoting the soon to be released movie "Dead In 5 HeartBeats. In this video you can see Chico in his own words talking about his life, the movie & his Brothers We had a blast hanging out with these guys & all the wonderful people that came to watch the movie. This is our small tribute to a friend, Robert "Chico" Mora, who passed away 1-1-2014. 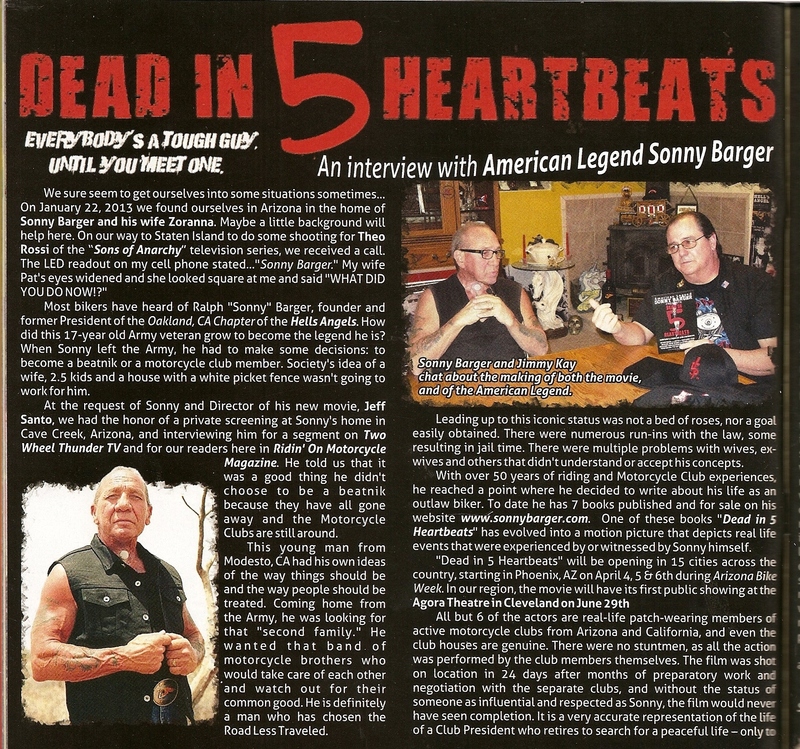 Director Jeff Santo recently partnered up with Sonny Barger to create an Independent film based off Sonny Barger's novel, "Dead in 5 Heartbeats". The Movie "Dead In 5 Heartbeats" is adapted from the successful novel by American Legend Sonny Barger, and was shot in 24 days entirely on location in Arizona. Real Hells Angels Club Members played a majority of the featured fictional motorcycle club members in the film, The Infidelz. Also, a majority of the MC's featured in the film were authentic and from the state of Arizona - The Hooligans, Alma, and The Rollin Knights. Cesar -- Canada's Own! His Take on the show.